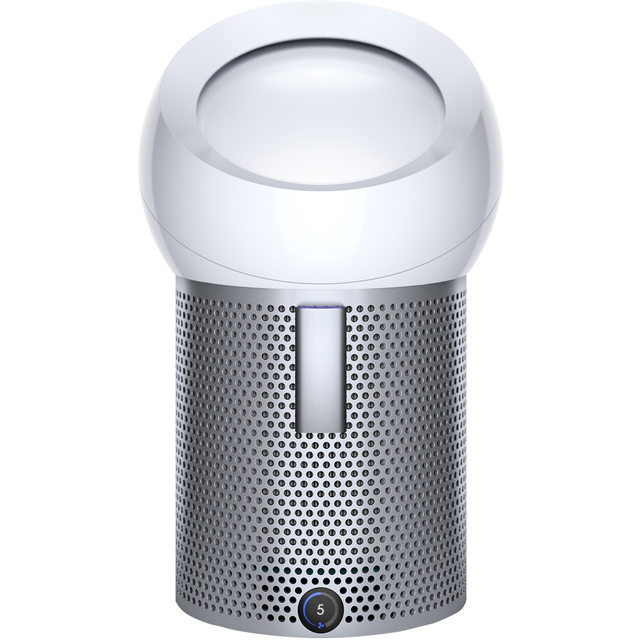 Keep nice and chilled with this Dyson Pure Cool Me™ personal purifier fan. It uses a clever HEPA filter which traps 99.95% of allergens and pollutants to let you breathe a little easier. The Core Flow™ design uses a special dome and high velocity jets to blast a focused air stream, which you can adjust to the best angle depending on whether you’re sat at a desk or relaxing on the sofa. It’ll oscillate up to 70 degrees, so it’ll cool your whole body while you’re lying down too. Set the sleep timer for anything between 30 minutes and 8 hours to enjoy a refreshing rest at night, or if you’ll doze better without the fan you can use the remote control to switch it off from the comfort of your bed. You’ll never breathe dirty air again, thanks to this air purifier’s super-effective sealed filter. By combining an activated carbon filter with a glass HEPA filter, it captures gases and traps 99.95% of bacteria and allergens*. So, you’ll always be taking in cleaner, healthier air, helping you breathe easier at home. * Tested for filtration efficiency at 0.1 microns (EN1822). Capture rates vary. With Dyson’s clever Core Flow™ technology, you’ll always get a cool breeze exactly where it’s needed. As the purifier takes in air from the surroundings, it’s guided over the dome at its head. Then, the airflows re-join to create a focused stream. Once you adjust the angle of the dome, the precise flow of purified air is channelled where you need it, keeping you perfectly cool and refreshed. If you like keeping cool while you sleep, this purifier’s timer will help you rest easy. As you’re jumping into bed, you can set it to turn off after anything from 30 minutes to 8 hours. So, whether you’re just having a quick nap or you’re settling down for the night, you can always stay perfectly cool and refreshed – even on those clammy, stuffy days. Enjoy a wider area of cool, pure air, thanks to the handy oscillating function. When you set this option, the purifier rotates from side to side in a smooth motion, to a range of 70°. So, if you’re relaxing on the sofa with your other half, you can both feel the benefit. This purifier has a really clear LCD screen that makes it effortless to keep an eye on it. Not only can you see which speed and settings the machine’s using, but it also lets you check the filter life – and it’ll even remind you when the filter needs changing. * This means it’s easier than ever to make sure the purifier working at its best, so you can continue enjoying its pure, cool air. *Based on time used. The filter life varies according to pollution levels. Have had my Dyson pure cool me for almost a week and can honestly say it is fab and well worth the money. I feel like i am sleeping better at night as it cools me down. Would highly recommend buying from AO.com as the service is fantastic. Received text and email the morning of delivery with a time slot and also driver phoned just as he was near.